Locking Pliers Ensure Tool Grip and Stability For Construction, Automotive, Plumbing, and Other Applications. These locking pliers are designed to increase grip and leverage for metal bending, forming, crimping, and other uses. The jaw mechanism increases the pressure on any style nut or bolt head, making it useful for all working conditions. The adjustment screw adjusts the plier size and pressure to hold various tool and part dimensions. 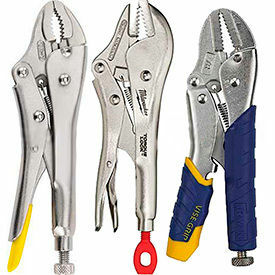 The pliers are made of heavy duty steel for strength and reliability. The trigger release mechanism ensures the maximum locking force. Available colors are black, blue/yellow, and steel. Plier Sets Are Used For Applications Including Construction, Maintenance, DIY, And More. Plier sets are made of high quality materials for long lasting durability and dependability. Sets include various gripping and handling tools for application and jobsite versatility. 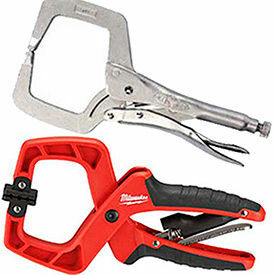 Pliers provide tightening, clamping, twisting, and turning leverage for user ease. Grip increases user comfort while reducing vibration and hand fatigue. Package quantities are 2, 3, 4, 5, and 7. Dimensions vary per model. Sheet Metal, Pinch-Off & Welding Hand Clamps Help Bending, Forming, and Crimping in Sheet Metal Work. These trigger release tools give you a powerful grip for work on large, thin surfaces. Tools allow you to clamp, form, bend, and crimp sheet metal. Available shapes are Flat and U. Capacities range from 3/8" - 3-1/2". OAL ranges from 7" - 9-5/8". Locking C-Clamp Pliers Ensure Hold Stability For Construction, Maintenance, Repair, and Other Applications. 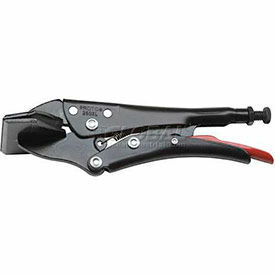 These locking C-clamp pliers have wide opening jaws to grip and support various sized tools and equipment. 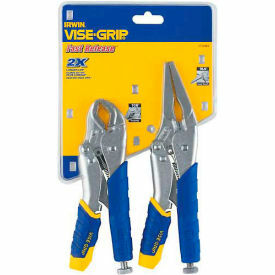 The pliers are made from high-grade, heat-treated alloy steel for added strength and durability. The guarded release trigger is easy to unlock and protects you from accidental release for safety. The non-slip grip surface improves handling control over parts and equipment for optimal comfort and performance. The turn screw is designed to adjust the plier pressure to increase or decrease the hold strength. Includes anti-pinch handles for added safety. Colors vary per model.